For well over two decades, there has beenone man who has made us all proud, has done India proud on the world stage andhas given our countrymen a reason to celebrate on number of occasions, but we,as proud Indians, just think, what have we given him back? I say, nothing,apart from applauding his brilliance, bestowing blessings and supporting ingood and bad times. You may say, what should/can we do more for him? Then,here, I give you an opportunity to do something for him, for the man who scaledpaths of glory through sheer hardwork and fighting against all odds made hisway to the top, the Cricketing Legend, the Master, Sachin Ramesh Tendulkar, ourvery own Tendlya. No doubt, he is one of the greatest batsmen ever seen by thisgame but moreover, I say, he is the greatest person ever seen by the mankind.Through this book, an earnest attempt has been made to decode the qualities andvalues which make him different and I tell you, these values make a perfectrecipe for a successful life. 'Chak De!! Tendlya' is just not about Cricket andSachin. Infact it is all about his, your, our life; about the moral values oflife which shapes and makes us a better human being. Sounds boring?? 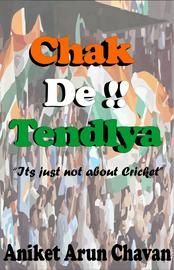 So, here'san interesting thing to spice it up, "While you read the book, Sachin Tendulkarwould be playing alongside a game of Cricket." Amazed!! What? You don't believeit. Go and just check in. Hurry! Unveil the fun. Born and brought up in Mumbai, Aniket ArunChavan is an avid cricket lover and a Sachin maniac. He loves reading. Some ofhis favourite books are Timeless Inspirator-Reliving Gandhi, The Monk who soldhis Ferrari, The Kite Runner, The Alchemist, just to name a few. He has beenwriting articles related to sports right from his school days. At present healso writes blog. He loves to express his feelings through writing. For Aniket,the two heavenly people residing on earth are, one is his parents and other isMaster Sachin Ramesh Tendulkar. Apartfrom Cricket, he loves to play football, badminton and table tennis. He holdsan Engineering degree from Mumbai University and an MBA in Marketing from MIT,Pune. Currently, he is working in a Sports Management company, SportzConsult,as a Sports Marketing Manager.